When looking to improve a commercial landscape Sacramento CA property owners and managers turn to upgrades that attract and retain tenants. By choosing the right commercial landscaping company Sacramento CA companies can ensure that amenities that will drive more business. And by focusing on commercial landscape maintenance Sacramento CA business owners can keep their properties looking pristine. That’s why so many Sacramento, CA, companies choose Aronson Landscape. Amenities are a great way to attract tenants, whether to an apartment building, mall, office building or office park. Your corporate tenants value locations with lots of amenities in order to attract and retain employees. Amenities run the gamut from having adequate parking to more elaborate waterscapes and outdoor patios. 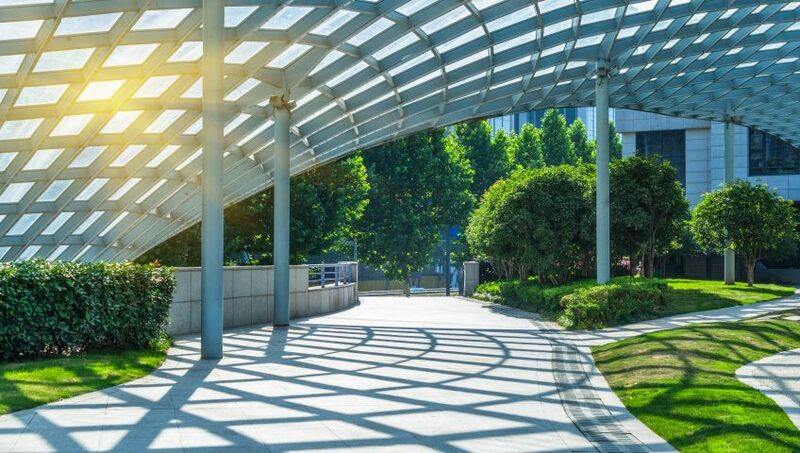 Work with a commercial landscaping company Sacramento CA area business leaders trust to strategize, plan and install the outdoor amenities that boost occupancy and retention rates. Pre-emergent herbicide applications that keep weeds and crabgrass from growing. These treatments won’t prevent the germination of seeds, but will limit growth. Timing is critical; if weeds have sprouted, it’s too late for these applications. Irrigation and drainage systems checks to make sure that downspouts, gutters, nozzles and sprinkler heads are working properly, cleaned and working properly. A complete property assessment to determine the status of the entire grounds. Having your commercial landscaper walk the grounds helps identify debris, damage, cracks, missing stones, damaged siding, missing roof shingles or issues that need to be addressed. Power wash your hardscapes and other outdoor amenities to keep parking lots, entryways, pathways and sidewalks clean and in good working order. Trim and prune trees, shrubs and bushes to remove dead material, keep their shapes, promote healthy growth and clear encroaching vegetation. 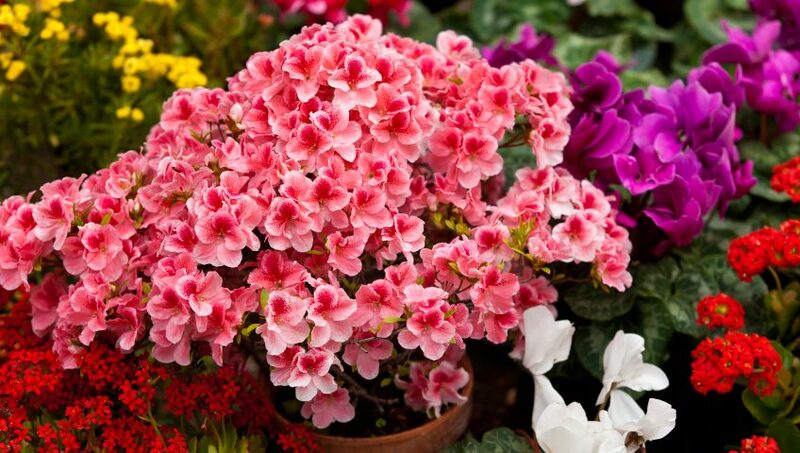 Plant new annuals and change up perennials to add new splashes of color. Add mulch to reduce weeds and beautify plant and flower beds. Aronson Landscape offers a full range of commercial landscaping installation, amenities and maintenance services. Learn more about our landscape design and ongoing maintenance by contacting us today. 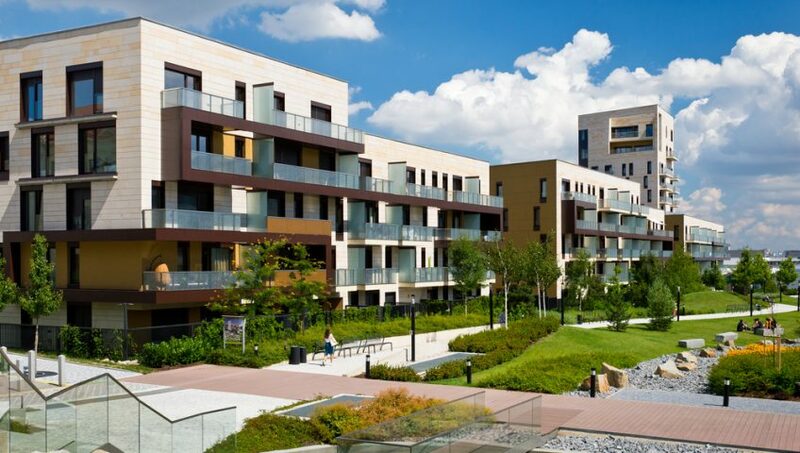 Are you the owner of an apartment complex and looking to attract more renters? One of the most popular multi-family amenities you can install in Sacramento, California is a dog park. For those with four-legged friends, having a place where they live where pets can run and play is among the best apartment amenities. Dog-friendly apartment amenities are becoming more popular across the country. They’re just one way you can add low-cost perks that make your apartment building stand out in a crowded market. Not only are apartment amenities a great way to build affinity and attract new renters, but they also provide owners with the opportunity for more partnerships. With a dog park, for example, you can partner with a local pet store to market services, offer coupons, or have them sponsor a pet “yappy hour”, “puppy pool party” or another outing at your site. A veterinarian office might consider holding a class on pet CPR or dog health or a groomer might show some techniques. You can find certified trainers in your area who would love to come and share their knowledge through The Association of Pet Dog Trainers. Outdoor Grilling and Dining. It’s not wise (or legal in some cases) to let renters fire up a gas grill or heat up coals. Consider taking part of your green space or rooftop and converting it into a community space with grilling. A communal grill and some comfy tables and chairs is a great service to provide. Pergolas. A large partially protected space gives your renters a great way to spend some time outdoors while out of the sun. Some outdoor chairs or lounges are a great way to give people a place to enjoy a glass of wine with friends. Patios and decks are other great ways to bring people together. Fun and Games. What’s greater than providing some space inside or out to help residents blow off a little steam? You can use a portion of your outdoor space to install a horseshoe pitch, a volleyball net, bocce ball or corn hole. Consider taking an indoor space and adding a pool table or foosball. These inexpensive amenities are easy to build and maintain, can appeal to renters of all ages and encourage community. Party rooms, game rooms or even movie theaters are other ways to raise eyebrows when renters are looking at your property. Fire Pits. There’s nothing like bundling up on a cool California evening and enjoying a blazing fire and a beverage. A fire pit can quickly become a community gathering spot and give your apartment complex a feature that few other buildings offer. For 11 years, Aronson Landscape has been helping residential and commercial customers create beautiful spaces that can be enjoyed by all. Let us bring our experience, creativity, and craftsmanship to your apartment complex. Contact us for an initial, free consultation. Examine the site: It is important to examine the site and assess the topography, soil, sun/shade, and utility. The professional you consult will then make recommendations and develop a design based of your budget and other constraints. What is the area used for: When beginning the planning process it is important to take into consideration who is using your outdoor area and for what purpose. This will help your professional landscaper develop a plan that accommodates your everyday needs. Whether you want extra grass for your pet to run around in, a front yard that showcases your gardening skills, or generous shade to cut energy bills, all of this is a crucial component of the development process. Hardscaping: Hardscaping is the process of incorporating entities such as walkways, driveways, pools, play structures, water features, and more within the general landscape of the area. 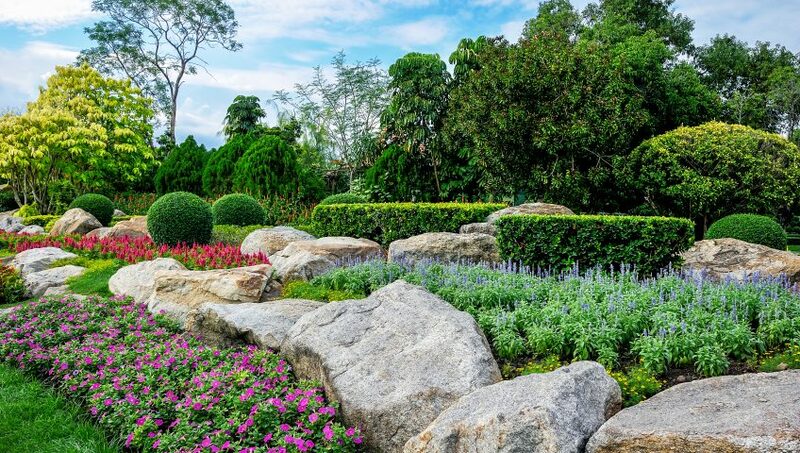 Within hardscaping, you will need to take into consideration different types of materials that will compliment the design, color, weather ailments and other relevant factors. The process is also extremely costly so take into consideration the price component within your budget. Unity: The last thing to consider is the overall unity and flow of your outdoor design. A professional will ensure that the appropriate amount of balance and scale is incorporated within the varying levels of trees, shrubs, and structures. Have trust in the process, but also feel inclined to interject if something looks out of place. For more information regarding landscape Auburn CA or to get your outdoor area fixed up today – contact Aronson Landscapes! Increase property value: It may seem obvious, but improve the landscape of your home will increase the property value drastically. In addition, it will also bring up the value for your neighborhood if the curb appeal draws in potential buyers. Hiring a professional landscape contracted adds as much as 15 percent value to homes. They can design low-maintenance gardens: These contractors can design low-maintenance gardens by utilizing plants that do not require frequent watering or trimming. This added benefit is great for individuals who travel often and leave their homes for extended periods of time. Native plants are excellent solutions for these types of backyards. A contractor will effortlessly tie these into your yard. They reduce water costs and reduce chemical applications. A popular trend that follows this style is called xeriscaping. Can help lower energy bills: Contractors can place trees and shrubs in a way that lowers energy bills. Essentially this is done by reducing heating and cooling costs when placing these in front or away from windows that collect large amounts of sunlight. Natural swimming pools: A natural pool is more similar to a pond than a normal “aquamarine-colored” pool. 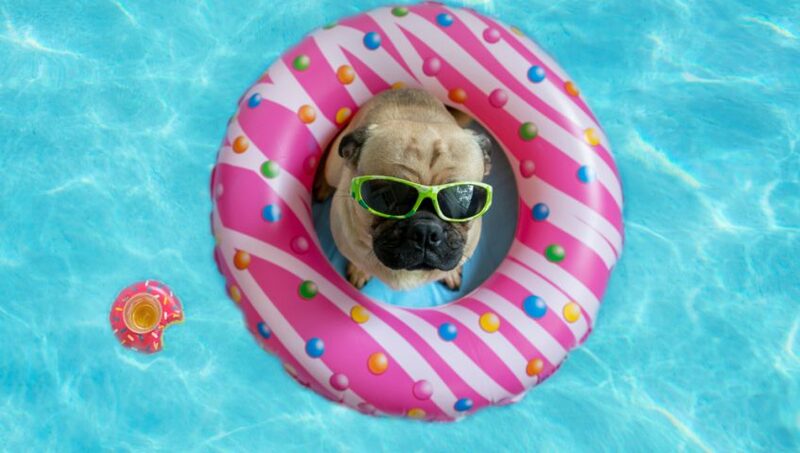 They have all the benefits of the chlorinated pool with less maintenance from harsh chemicals. Irrigation system: Landscape contractors and create the perfect drip irrigation systems to bring water right to the root and as an eco-friendly alternative to the traditional sprinkler route. This helps with over watering and will help you save on your water bill. For more information contact Aronson Landscape for affordable commercial landscaping Auburn CA! First impressions are everything. That is why commercial landscaping Sacramento, CA is a crucial component for any business. We can’t avoid “judging a book by it’s cover,” likewise we can’t help but make assumptions about a business based off their external upkeep. Aronson offers affordable commercial landscaping Sacramento, CA so that you do not have to lose customers who turn a blind eye to your outdoor scene. Curb Appeal: Since people are making conscious and subconscious assumptions about your business based off the exterior, it is important that you maintain the appearance frequently. This will affect the foot traffic your company generates. Characteristics of your business are also revealed in how well your landscape is maintained. Attributes that come from this include how detail oriented you are as well as your organizational practices. In the long term, a maintained landscape will yield economical advantages as people spend more at businesses they regard as good. This includes perceptions of a nice, neat, and well-kept company. Nature can help with your energy bills: An overlooked benefit of routine lawn maintenance is that it can actually help your energy bills like heating and cooling systems. An example of this is how trees can help shade parts of the building, reducing the need for AC. In fact, it is shown to have lower cooling bills by nearly 25% for some offices. For companies whose buildings experience snow seasons, proper landscaping can be used as a snow barrier and wind blocker to keep the structure warmer during those times of year. 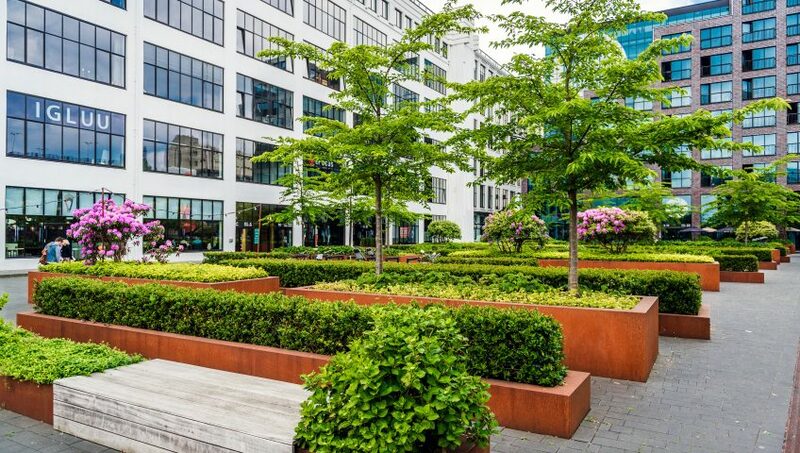 Increased privacy and living areas: A properly maintained landscape can also help with your privacy from other nearby business, warehouses, and public areas. In addition, a well-kept outdoor area makes for a great meeting space to entertain clients or hold company events such as BBQs. The improved air-filtration quality from the surrounding plants and greenery will lead increased productivity for employees. For more information contact Aronson Landscape, the top commercial landscape Sacramento, CA – we are eager to assist you! The end of summer is nearly approaching, which means the fall and winter seasons are about to begin! While this is a lovely time to throw on a big sweater and cozy up by the fire, the cold rain and snow is not the ideal weather for your landscaping, especially in the cold Auburn CA winters. If you have Residential Landscaping Auburn CA you must know how to prepare for these cold months to keep your landscaping nice, clean, and healthy. Your favorite Landscaping Company Auburn CA Aronson Landscape is here to help! Below are some tips on how to protect your landscaping during Fall and Winter. They say that spreading fall mulch is better for the plants than spring mulching. Mulching helps protect roots from frost and helps retain moisture during a cold and dry winter. You should have two to three inches of mulch spread around the roots of your trees, shrubs, and bushes. It is important to remove dead and dying bushes and plants before the winter months take over, especially in Residential Landscaping Auburn CA. When doing this it is important to not remove any dying stalks because new buds will form in the spring! If you have any questions about what to remove and what not to remove, call Aronson Landscaping Company Auburn CA. Early fall until the ground freezes is a good time to plant trees and shrubs. Not only do cooler weather and autumn rain put less stress on young landscaping plants, nurseries often have sales to empty their shelves before winter. Nurseries need to sell every plant by December 1st. They often will sell plants at a great price due to this strict deadline, so take advantage of it! Aronson Landscaping Company Auburn CA is here for all of your landscaper Auburn CA needs! Call the Residential Landscaping Auburn CA experts at Aronson Landscape today! Are you looking to revamp your yard and make it stand out from your neighbors? Look no further! 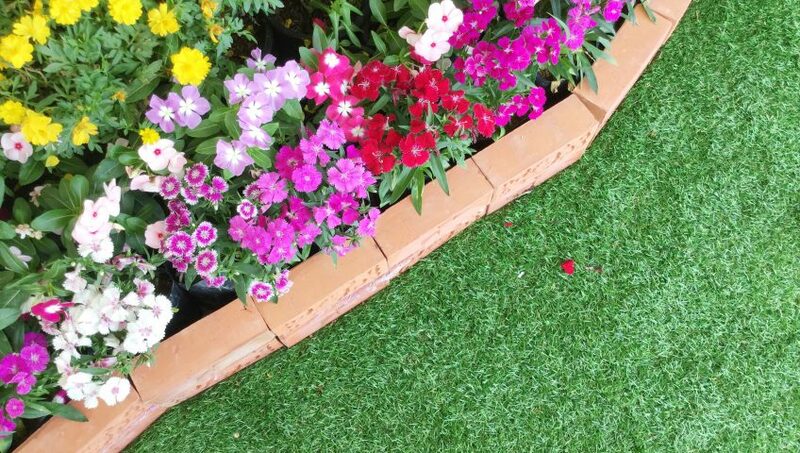 Aronson Landscape is the lead landscaper Sacramento CA, as well as the number one commercial landscape Sacramento CA, and the best Residential Landscaping Company Sacramento CA. Aronson Landscape is here for you in redesigning and landscaping your yard in Northern California. Below are 5 Easy Landscaping Ideas for your spring yard. Structural Plants are great for any modern yard as it adds height, drama and quality. An example of a structural plant, and our personal favorite is the snake plant! This plant is absolutely perfect for Residential Landscaping Sacramento CA to make a statement. Just as sculptural plants can add height, cascading plants add another level of landscaping beauty to your yard. These plants add simple beauty and can fill in the gaps to any commercial landscape Sacramento CA. Silver Falls dichondra (also known as silver ponyfoot) has a silvery blue-green sheen, and it does well in drought-tolerant areas. Statement Shrubs, like rose bushes, are essential for making your residential landscape stand out. Shrubs add height, texture and variety to your yard. Plus, they can fill in those problem areas, even hiding unsightly features, such as the junk in your neighbors’ yard! Want to transform your summer landscape? Contact Aronson Landscape today for a free estimate. Are you an Auburn, CA, area resident looking to reinvigorate your property this summer? Look for residential landscape design Auburn CA residents know will delight and transform your yard. With a flair for creativity and expert care, Aronson Landscape offers landscaping services Auburn CA loves. Here are a five ideas for summer landscaping Auburn CA homeowners are building and planting to enjoy all year. Edible Gardens. Permaculture is a growing trend across the world, and the popularity of planting edible gardens is increasing rapidly. Many homeowners choose to start simple by planting perennial herbs before working up to vegetables, fruits, and edible flowers. Some choose to plant hanging fruits and veggies. A similar idea gaining ground is planting a natural dye garden. Among the plants that can be planted are indigofera (blue), larkspur (yellow), lilac (yellow/orange), and even carrots (orange) can be used to create natural dyes used to color textiles, yarn, and clothes. Just Add Water. Water creates a beautiful contrast in landscaping Auburn CA choose this year. At Aronson Landscape, we can help you with a residential landscape design Auburn CA neighbors and visitors will love. Want to add a pond with fish? How about a fountain or waterfall? Adding water will attract different types of wildlife, and give you new sights and sounds to enjoy as part of your backyard this summer. Using natural stone to contain the feature adds to the aesthetic. There are many options available for plants to add to your Auburn, CA, property. Choosing native plants is always a good choice. They will usually grow stronger and require less upkeep, reducing your maintenance needs and cost. Potted plants are a great way to add different shapes, colors, sizes, and heights to your landscape. Potted plants can add splashes of color to different yard areas, with whites and pinks popular choices for summer months. And with potted plants you can swap them around and change them with the seasons. Diverse plant installations with species that bloom at different times of year help you add lovely variety and surprises to your vista. Looking for a particular plant idea? Try lavender, which adds aroma and bursts of color while requiring little watering. It also doubles as a bug repellent. When choosing Aronson Landscape for your landscaping services Auburn CA residents can create designs that incorporate lighting for safety and style. Landscape lights play many roles, from illuminating sidewalks and steps or to highlight garden beds, trees, and shrubs. Lighting fixtures can also be added to some covered patios enclosures to let you relax in comfort and illumination. Towering trees may not work in every yard. Go small with shrubs instead, with dwarf varieties that can create beautiful options with very little maintenance. Does your Sacramento, CA, business want to make a great impression on customers, residents, and visitors? With commercial landscaping Sacramento CA businesses can improve their curb appeal and more. With the right commercial landscape Sacramento CA businesses have a real advantage and can attract new business and great ratings. For affordable commercial landscaping Sacramento CA companies turn to Aronson Landscape for expert design, maintenance, and repair services. Why the maxim states we shouldn’t judge a book by its cover, the reality is that people will evaluate your property based on what they see when they approach and first arrive at your business location. Impressions matter, whether you’re attracting new residents to a condo complex, new members to a golf course or country club, or customers to a shopping complex. Commercial landscaping Sacramento CA residents notice, for good reasons, can raise eyebrow. Clean, manicured lawns, cleared paths and driveways that are in good repair, and well maintained flower, bush, and tree beds cast an impression. These traits indicate that the businesses and services are quality and professional. one that is not likely to attract visitors or customers. Employees want to work in an environment that’s well maintained and has hardscapes and other features that they can enjoy on breaks and in quiet moments. Workers in a well-maintained property are likely to be happier, more productive, and more engaged in their work. Great commercial landscaping helps your business attract and retain great employees. Those employees will be inspired, innovative, and healthier. Resale value. When you are ready to sell your business, having a great commercial landscape will improve the sale value and interest of potential buyers. 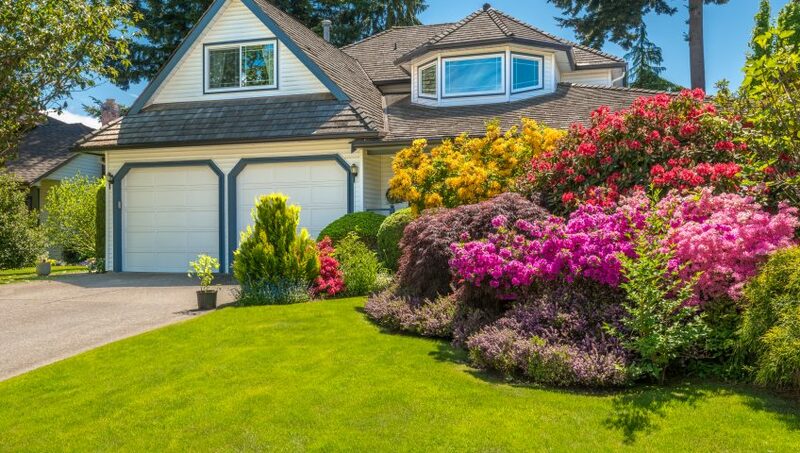 Neglecting landscaping maintenance means either lower sales prices or expensive costs to bring the property up to the proper quality to put the business for sale. Healthy ecosystem. With the proper care, your trees, shrubs, flowers, and laws are going to be stronger and healthier. That means less long-term expense to repair, prune, maintain, and replace the greenery. Reduced costs. When you’ve invested in proper maintenance of your commercial landscaping, you’ll have fewer long term costs. Consider, for example, your irrigation system. When your commercial landscape maintenance plan includes regular inspection of the pipes, sensors, and valves you will save on utility costs and replacement needs. For affordable commercial landscaping Sacramento CA property managers and business owners alike count on Aronson Landscape to do commercial landscape design and maintenance. Our clients include office parks and retail centers, apartment and condo complexes, government buildings, schools, medical facilities, and corporate headquarters. Let Aronson Landscape help your Sacramento, CA, business make a big impact for visitors and employees. For Sacramento, CA homeowners associations (HOAs), choosing what types of landscaping to install each year can get complicated. As with any residential landscaping Sacramento CA residents will do well by having a unified plan that enhances the neighborhood. When choosing the right residential landscaping company Sacramento CA HOAs can find a partner who will help develop and install the right plan that members will love. And when it comes to residential landscape maintenance Sacramento CA HOAs should choose a partner that will preserve and protect the investment. Here are 5 tips for your Sacramento HOA landscaping plan. Native plants will take to the Sacramento, CA, climate and growing conditions, helping them remain healthy and strong while taking less maintenance. Flowering perennial flowers are a good choice as they will provide beautiful colors each year without the need for replanting. Think about shrubs and bushes that will add variegated or colored foliage or are evergreens. In the winter months when fewer things are in bloom, having some splashes of color around will help beat the blues when other plants are not in bloom. If you pick slow-growing varieties, you won’t have to prune or trim them as often either. When you want to do more than planting garden beds, consider using containers of different sizes to mix it up. Containers let you differ the heights of your flowers and plants and use different design elements to complement common spaces, buildings, entrances, and offices. They can also reduce the amount of mowing and other maintenance if combined with stone beds or other design elements that contrast with other plantings. When planting bulbs as part of your residential landscaping Sacramento CA HOAs can add a reliable perennial source of color. Bulbs offer multiple color options and can be planted once while providing annual bursts of blooms from spring through the fall. Spring-blooming bulbs are usually heartier plants that can withstand a variety of temperatures and will multiply on their own. You’ll save in replanting costs next year when bulbs begin to propagate in nearby spots. Work with the residential landscaping company Sacramento CA HOAs have worked with regularly to decide where things should be placed. You want to be sure shrubs and bushes, for example, are not located too closely to walkways or driveways. Shrubs that have room to grow also won’t need to be trimmed too often. You also want to be sure that containers and shrubs are not placed in such a way that they make it difficult for lawnmowers to get to nearby grasses. Plants, flowers, and grasses need water, meaning your landscape plan needs to consider irrigation. With a trusted partner for residential landscape maintenance Sacramento CA HOAs can develop and maintain an irrigation system that conserves natural resources and keeps landscaping nourished. At Aronson Landscape, we’ve been helping Sacramento, CA, HOAs and other residential and commercial customers develop and maintain beautiful landscaping since 2008. From landscape design to maintenance, our teams are here to help create and grow plans that add beauty and lushness to your property. 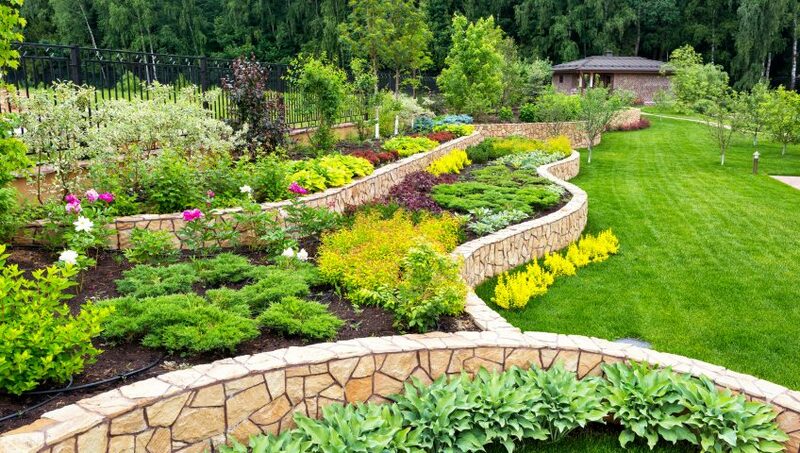 If you are looking for Residential Landscaping Sacramento CA, turn to the experts at Aronson Landscape.